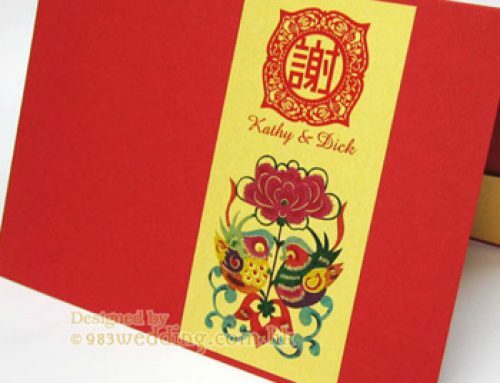 Dragon and Phoenix are good wishes symbols for Chinese people. They are always used in different kinds of celebrations. 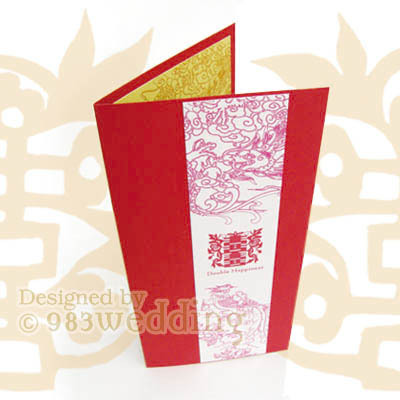 The pattern of dragon and Phoenix are also commonly used for wedding celebrations in Chinese tradition. 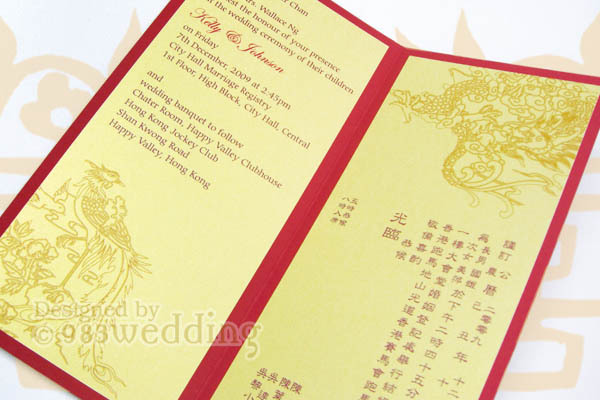 Dragon and Phoenix are always used for wedding celebrations in Chinese culture. 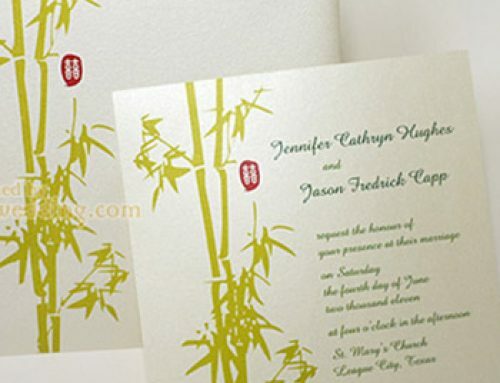 You should have certainly seen this pattern if you have attended to any Chinese or Asian weddings before. They will be used as venue decoration. You may see it on the guestbook. They may even appear on the tableware. Of course, they will also appear on the wedding card. To this end, this design also adapts the idea of using such patterns. Yet, we will never make the design look old fashioned. we have attempted to make the design modern and trendy. The base color of the cover is red. This is considered very traditional in Chinese culture. Yet, the texture of the paper chosen is exquisite. 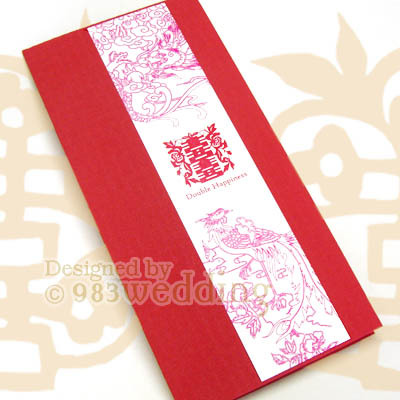 A pearl color strip, with a red color dragon-phoenix pattern printed on, is mounted on the cover of the card. This is to accentuate the elongated proportion of the card. Of course, this will also make the design look more stunning. A double happiness symbol is at the center of the strip. The symbol is used to visually tie the Dragon and Phoenix graphic elements together. 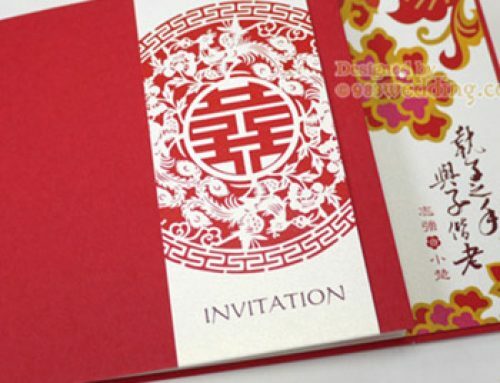 All these patterns remind the receivers of the invitations that it is a wedding! It is something meant to be joyful! The dragon-phoenix pattern appears again on the insert. The dragon is at the upper right corner while the Phoenix is on the lower left corner. 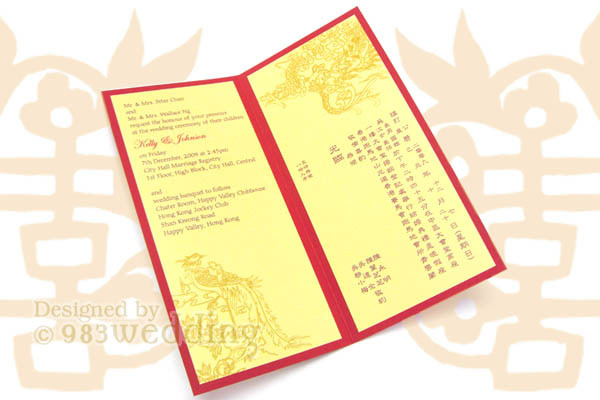 Two languages of wordings will be printed on the two panels of the insert. 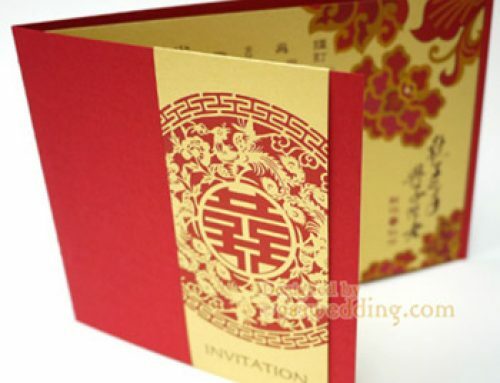 The material of the two panels of the inserts is a 250gsm gold color card. They are mounted on the card inside. After gluing on the cover inside, the card will become thicker. It is a card which is a bit thicker than a normal card a thin paper insert! 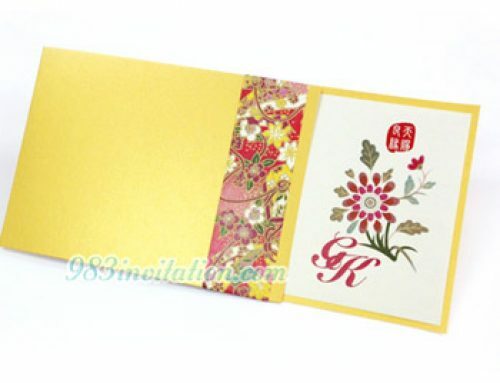 Insert: 250gsm gold color paper with full-color printing on ONE side mount on the card inside. Return address would be printed on invitation and R.S.V.P. envelope on request. Place card, menu, church program & thank you card would be ordered with the same design.